The resort's pool is set in a quiet spot by a gorgeous pond. Perfect for hanging out or enjoying a family dinner while on vacation. Many rentals here include decadent showers. Kids will love the novelty of giant checkers. This exquisitely maintained 18-hole course wraps around the resort. Practice your game on one of three tennis courts. The resort wraps around an 18-hole championship golf course. Grab a good book and park yourself on a patio chair. Every suite has its very own terrace. 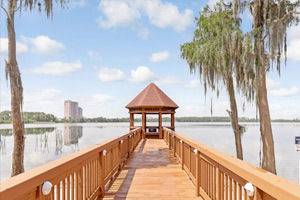 Awarded a TripAdvisor Certificate of Excellence, Marriott’s Sabal Palms is located in the heart of Orlando, adjacent to the Orlando World Center Marriott. Sabal Palms is a calm resort with a small, intimate pool area that has fun games of life-size chess and ping pong for the kids. For the athletes, the resort has tennis and volleyball courts. When it’s time for lunch, take advantage of the bbq grills for a fun family cookout. Let the little ones help carry hot dogs, burgers, and sides while the grownups handle the plates, utensils, and condiments. Ready for more underwater fun? Then head on over to the Orlando World Center Marriott. Check out the Falls Pool Oasis; it has waterslides that will be a big hit. Little ones will have a blast at the splash zone children’s pool. You’ll also have access to The Spa at World Center Marriott. Book an appointment for a relaxing massage, facial, or nail treatment. While you’re unwinding at the spa, the golfers in your crew can check out Hawks Landing Golf Course, the on-site eighteen-hole championship course designed by Robert Cupp Jr.
Two-bedroom condos sleep six guests and offer all of the comforts of home. As Marriott’s first vacation rental resort in Orlando, the condos here are much larger than others in the area. Living rooms are spacious and most face out onto views of the golf course and surrounding forest. Bring the family along on the short drive to Publix; your full kitchen won’t stock itself. Back in your condo, assemble your famous lasagna and let the little ones help with cheese distribution. Don’t worry if the kids end up covered in sauce; you’ll have an in-suite washer/dryer to take care of that. Once the lasagna is in the oven and the clothes are being washed, pop in a DVD for the kids to enjoy. Now the only question is: Finding Nemo or Toy Story? Disney Springs is Walt Disney World’s® premiere shopping venue. Visit the largest Disney character store in the world, World of Disney®. It features apparel, stuffed animals, and toys. Treat yourself to a new handbag from Kate Spade, or jewelry from Pandora or Alex and Ani. Little ones will love The Lego Store, Build-a-Dino, and the Bibbidi Bobbidi Boutique. SeaWorld is home to Orlando’s tallest, fastest and longest rollercoaster, Mako. Ride Kraken Unleashed, it’s a floorless virtual reality coaster or fly like a manta ray on Manta. Enjoy an animal show or experience featuring dolphins or penguins. Walt Disney World’s® Magic Kingdom® is where you will find Disney’s most classic attractions. Ride It’s a Small World, fly with Dumbo or Peter Pan, or party with nine-hundred-and-ninety-nine ghosts in the Haunted Mansion. Movie fans will love Universal® Orlando’s two theme parks: Universal Studios® and Universal’s Islands of Adventure®. Come face to face with life-size dinosaurs on the Jurassic Park River Adventure®. Ride the Hogwarts Express at the Wizarding World of Harry Potter®, try butter beer or attend a wand-choosing ceremony.